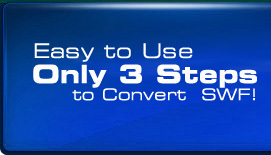 Purchase Flash SWF to Video Converter for converting swf to video files. There is a 30-DAY MONEY-BACK GUARANTEE! on our products, even though you have no time limited to try it for free before registering! The 30-day money-back period starts at the time of registration (purchase). If you buy now you will be enjoying all the benefits of the registered version within minutes! "I have just started using the program and have found it VERY simple and straight forward. Thank you for keeping it user friendly. I am able to share my Flash with my grandma on my iPod now. Thanks again."